Find hotel near Beijing Five Pagoda Templ .. The attraction is located near to Beijing zoo and is a picturesque temple in the destination. Beijing Five Pagoda Temple is perfect if you are looking for a tranquil and spiritual experience. 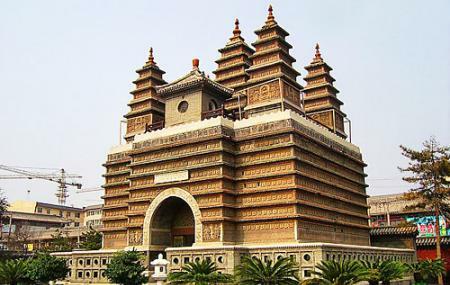 The temple was known as Zhenjue Temple before and the constructions began in Yongle years (1403 - 1424) of the Ming Dynasty (1368 - 1644) and completed in 1473. Visit the destination and get to see some of the most beautiful temple in the area. Also, visit the popular attractions in the city by following Beijing itinerary 7 days. Take A subway from National Library. Take a bus from National Library. How popular is Beijing Five Pagoda Temple? People normally club together Big Bell Temple and White Cloud Temple while planning their visit to Beijing Five Pagoda Temple.